An author of books on historic landmarks and the places that gave birth to historic events returns to his home town area to visit his own personal landmarks. I love visiting historic landmarks. But as I get older I have also started visiting some "personal" landmarks have helped shape my life. You know the places. Maybe a first date or a memorable ballgame. Where you became a witness to something great or even small. Where you learned to ride a bike. Or where you first fell off. They may not have plaques or markers but personal landmarks represent our own histories, and if you go back once in awhile and even document them, you might be surprised at their power. These are places where memories may still hang; memories that may trigger some strange emotional pulse that helps clarify or make sense of your life today. I took a journey like this recently as part of my latest book, Hello It's Me, Dispatches From a Pop Culture Junkie. The book is a collection of essays and stories about some people, places and things I've been fortunate enough to rub up against (or vice versa). Writing the book was a chance to time travel a bit, recalling past experiences and trying to craft them into story form. I moved away from the New York area to California in 1987, and while I return the city often enough, I had not done much in the way of exploring landmarks where I grew up, slightly north in Westchester County. So I took this as an opportunity to return to places I'd never been back to, and along the way, reconnected with some people from the past. 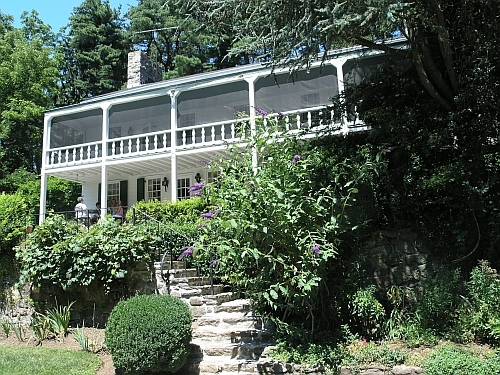 As a teenager, I had the good fortune to study with the great American fiction writer John Cheever. He was a neighbor and, after I wrote him to ask for help with my writing, he obliged by inviting me over to his house to review some stories I'd written in school. This began a friendship that last until he passed away in 1981. On vacation in New York two years ago, I drove past the Cheever's house on Cedar Lane near Route 9A in Ossining. 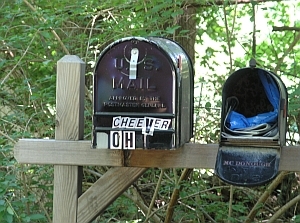 Out on the road in front of their property, the old gray metal mailbox I remembered with the name Cheever hand–lettered in black paint had been updated. Peeking down the driveway and looking at the house set back against the woods, I could picture him getting into his red Volkswagen Rabbit to drive me home after that first visit. Then I thought back to what he told me at that meeting: "Keep a journal, start today and don't stop. It forces you to write and that's good. Writers write, they don't talk about writing and a journal strengthens the muscle. So go. Write." It all came back, like some cinematic flashback. And then I knew I had to go up and sit on that porch once more where Cheever and I spent many an afternoon. Cheever's widow, Mary, is still alive. And as I discovered, she still lives in that house. So I contacted her and asked if I could visit what was for me, a most important personal landmark. And she was just as gracious as her husband had been more than thirty years earlier. Dissolve to the summer of 2009. As I wrote that night, "Surreal to be back on the porch where I'd sit with John Cheever. It was a perfect lazy summer day and the yard glows green from all the recent rains. The Cheever's Dutch Colonial Farmhouse (built in 1928 to resemble a house hundreds of years older) looks just as it did when I was last here almost 30 years ago. Set back in he woods, it still feels like a writer's retreat. On the side of the house is the maple tree John Cheever would often sit under when thinking and writing. "Just inside the front door his chair still sits by the fireplace, surrounded by his books. It's like he is still there, no doubt because his widow, Mary Cheever, still misses him a great deal. At 92, she maintains the Cheever legacy with grace—proud of her husband's literary accomplishments, but honest about his demons. On this day, with my wife, children and her live–in helper Alexis, Mary and I caught up. 'John was an egotist so of course he loved talking to you about himself,' she laughed. 'But he loved talking about writing, too, and his belief that it was very hard work. At least it was for him.'" "Mary invited me to sit in John Cheever's chair, and I accepted. 'It was good he spent some time with you for those years,' she said. 'Young writers were important to him and I'm sure he'd be happy to know you brought one of your books to keep here in this room. He enjoyed your company back then because unlike many others at the time, you asked for nothing of him besides some guidance. He liked that earnestness and innocence. He felt like he was making a difference with you."" I am so glad I went back to that landmark. Also in that course of that same day, I went back in search another ghost—at a day camp called Royal Rock.